The Eastern Carolina Chapter raised funds for chapter activities and projects on an early March Saturday morning by laying the concrete masonry units for two baseball field dugouts at Christ Covenant School in Winterville. Twenty-two members participated. Materials, equipment, and labor were provided by Adams/Oldcastle, Manning Masonry Inc, Joyner Masonry Works, Rush Construction, J. B. Overman Masonry, Bembridge Masonry, and RE Harris Masonry. HydroClean provided lunch. Photograph by Tim Manning. 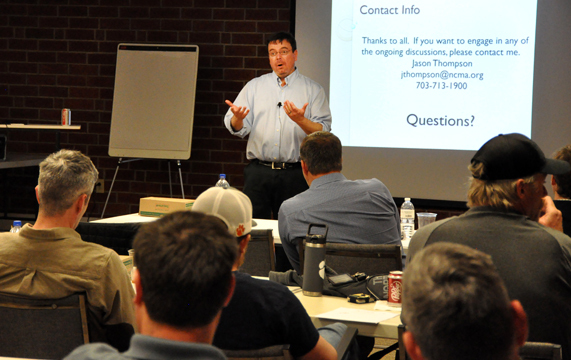 In February, Jason Thompson (facing,) Vice President of Engineering with the National Concrete Masonry Association (NCMA) was a featured presenter at NCMCA’s Masonry University 2019. McGee Brothers Company hosted the session, provided as an opportunity for NCMCA certified individuals to obtain required continuing education credit, at their Greensboro facility. Thirty-two individuals participated. John Cramer of TriSure Corporation and the NCMCA Insurance Program provided a timely update on safety issues and insurance coverage and liability concerns. Members of the NCMCA Western Carolina Chapter visited Fred T. Foard High School near Hickory at the end of February to present a program on construction and masonry careers to students. They also enjoyed visiting and handling trowels with students in Jeff Yount’s masonry class. Pictured, Brian Cook of Masonry Unlimited of Cherryville talks with the students. He was joined in the masonry shop by CE Moser of Adams/Oldcastle and his partner at Masonry Unlimited, Martin Browne. Bob Wins at Las Vegas! Jan Peleaz Garcia (left) is the winner of the North Carolina SkillsUSA “Rally Day” masonry competition held the end of February at Wilkes Community College. Garcia is a student at John F. Kennedy High School in Winston-Salem where he is instructed by Dean Bagnoni (right.) Aimar Dominguez-Noyola, also from Kennedy High School, won the Masonry One division contest. Some sixteen students participated in the masonry events. Photograph by Ryan Shaver.